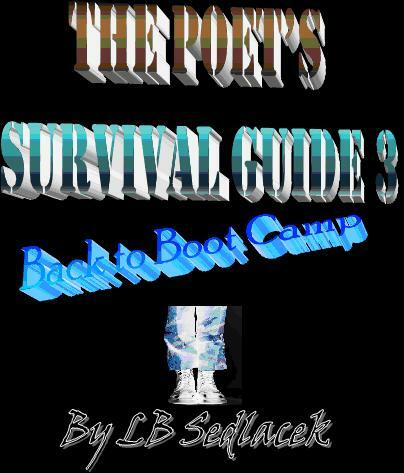 The Poet’s Survival Guide series is back with a part 3, a new offering for 2012. In this guide for poets, get back to the basics to sustain your life as a poet. Improve your odds. Create your best poems. Figure out which way to go: electronic or paper. Branch out and get your poetry fix while creating and maintaining new and tried and true ways to continue your career as a poet. Excerpt from Chapter 3 “Poet or Poetry on the Side?” — Getting to a place where poetry isn’t just on the side for you will really help you grow as a poet. It’s easy to compartmentalize portions of your life and maybe you have to do that to survive (no writing a poem while you’re taking an order, life guarding, helping a customer select a lawnmower, speaking in a lecture hall, etc.). If you aren’t able to be a poet all day (or all night) long, then it’s a good idea to find a way to connect to poetry in a way that works for you. “The Poet’s Survival Guide 2″ features more of what you should know and do to make a living or a part-time living writing poetry. Featuring 11 chapters on how and where to sell your poems. Includes PR tools that you can use to promote your work plus innovative ways to make some bucks selling your poems. Also includes Secret Poet Weapons plus links and resources. Contains 17 informative chapters for new or established poets trying to earn and make a living with poetry. Poetry journals and magazines are well known for paying in copies, which is nice if you like most poets enjoy reading. However, this doesn’t pay the bills. If you are able to explore all forms of the craft, your odds increase as to your likelihood of getting published … and paid! The Poet’s Survival Guide will give you an insight into the tools you need (and probably already have) to make a decent living or a fair amount of extra income at writing poetry or writing in forms similar to poetry. Includes links to poetry marketing, poetry publishing and other writing resources. The readers who buy poetry and/or just read it are few and far between, but there is a market for it out there. More importantly, there can be a market for you as a poet in your own home town. Plus there are other ways you can use your skills for writing poems to earn money with poetry related writings. The nice thing about poetry is that the investment of time and work for the poet or writer can be much less compared to something like a novel or screenplay which can take years to finish – not to mention how much longer it can take to get them published. People who read poetry tend to make up a diverse audience which means they also tend to be widely read. Why not take your poetry and parlay it into other writing venues besides poetry as well as into paying poetry publications?